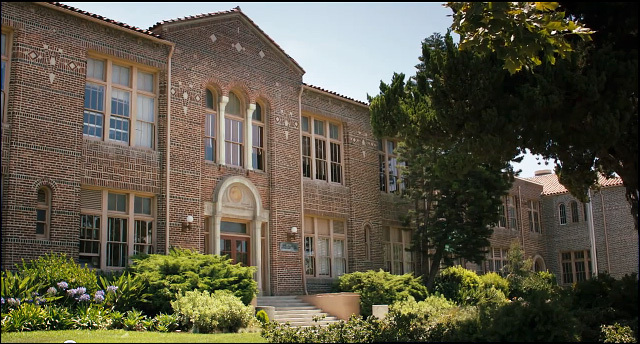 of the fictional Brookside High School in filming this movie. And only one of them was an actual high school. The other two were middle schools. (as Randy Newman might say) "from the South Bay to the Valley..."
(between Wilshire & 6th St), in the Hancock Park section of Los Angeles. 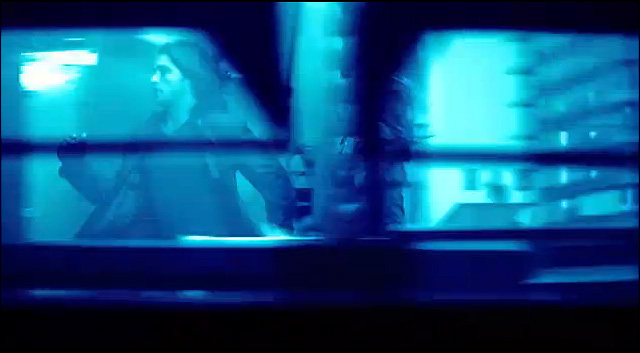 The hallways scenes with the green woodwork (seen below) were also shot at John Burroughs. of the school and talks to her friends (about the prom) in front of the lockers. classroom at Lakewood High School, 4400 Briercrest Ave, in Lakewood, CA. 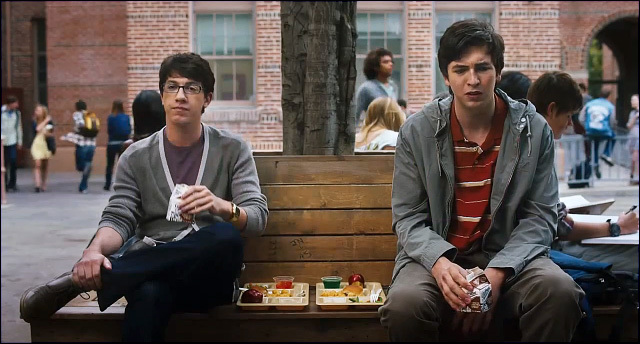 It's the only one of the three schools in this film that is an actual high school. Quite a few other scenes were shot at Lakewood High as well... Stay tuned. For this one, we need to travel about 47 miles northwest of Lakewood, to the San Fernando Valley. See the athletic field scene below? The field with the tall trees in the background? at 9351 Paso Robles Ave, in Northridge, CA. That cheerleader scene was shot on the grassy field on the west side of the school. In that screenshot, the camera is looking south/southwest towards that cluster of trees. 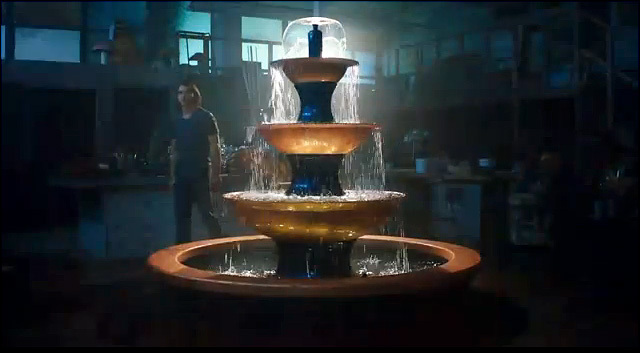 and where the principal tells Jesse he has to help Nova rebuild everything. Take, for example, the high school auditorium seen below. That was shot in the auditorium at Lakewood High School. And so was the scene below, the brief glimpse (through a blue filter) of the kids running through a kitchen. 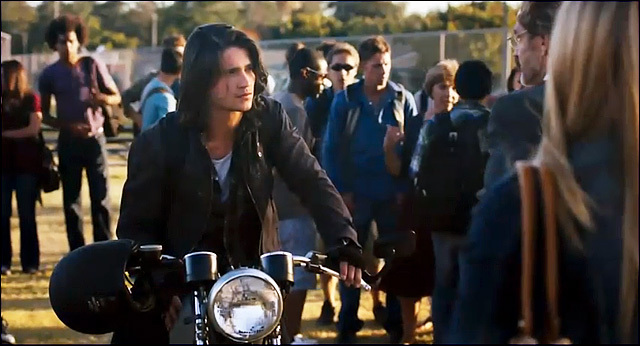 But then, we're suddenly back in the Valley, for an outdoor scene with Jesse on a motorcycle. That scene was shot on the same athletic field at Holmes Middle School. 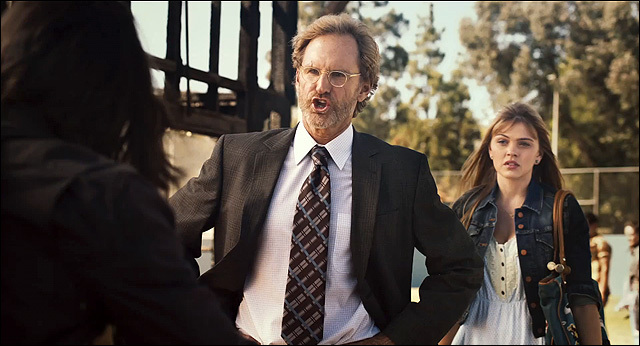 The shots of the brick school exterior were shot at John Burroughs. 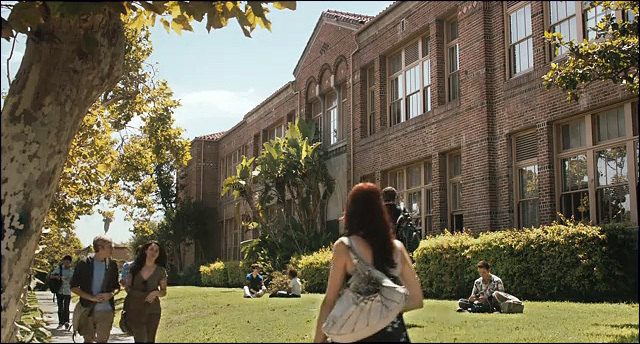 The classroom/interior scenes were shot at Lakewood. And the grassy athletic field scenes were shot at Holmes. But, for better or worse, it's not quite that simple. The hallway scenes, for instance, were divided up between both Burroughs and Lakewood. The halls at Burroughs have green doors and woodwork, and slightly arched ceilings. The halls at Lakewood have tile walls, and the lockers are flush with wall. Burroughs is brick while the more modern Lakewood High isn't. Obviously, this final quad scene (below) was shot at Burroughs. This filming location is nowhere near the other three. It's way over near Pasadena, CA. passes under a small road named Yucca Lane. 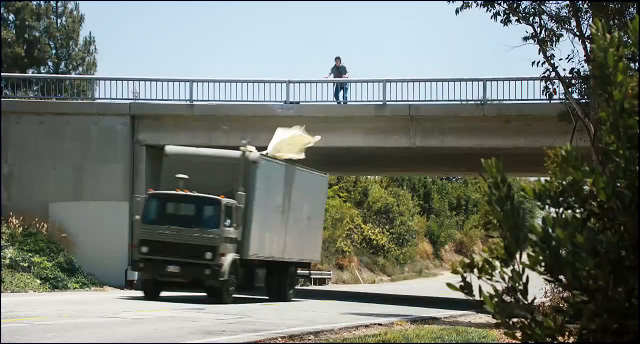 And it's here that they filmed the truck scene. is heading west on Oak Grove Drive, and Lloyd's would-be prom date (Jen) is driving east on that same street. (south) side of a divided road - and traffic in both lanes of that side of Oak Grove can only go east. 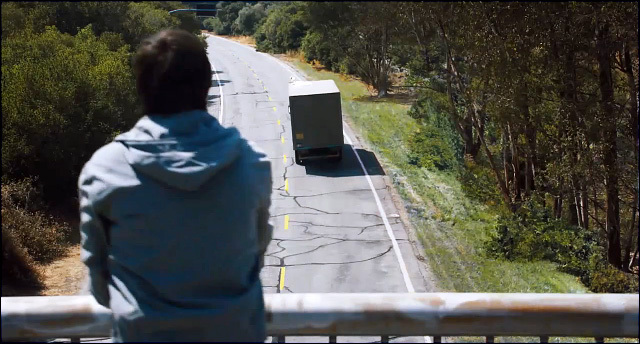 In the screencap above, Lloyd is looking west, and the camera is looking east, up from Oak Grove. shot, using the school's 6th Street side (the North Building) this time, instead of the Administration Building. Below is a night shot with prom-goers entering what would seem to be the dance in the gym. which faces west onto McCadden (just south of the Administration building). building, near the northwest corner of the school campus. (The camera is looking west). They stay at Burroughs for this hallway scene (note the green woodwork and lockers). But then they shift again to the Valley and Holmes Middle School, for this outdoor shot. 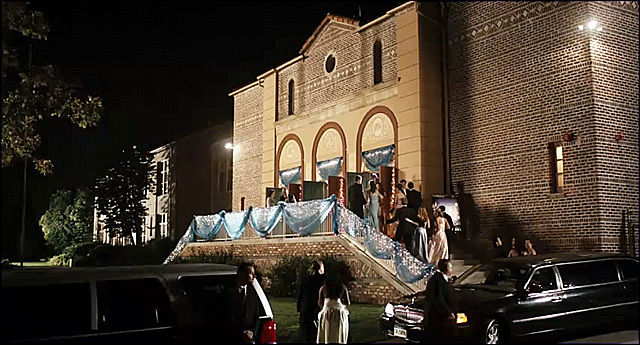 prom decorations, was filmed in the art teacher's classroom at Lakewood High School. 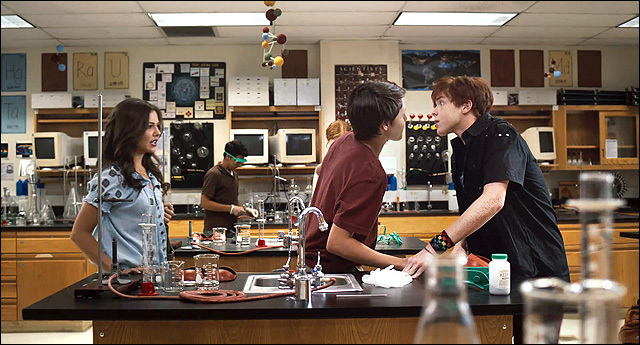 And we stay at Lakewood High (the science classroom) for this funny scene in the science lab. 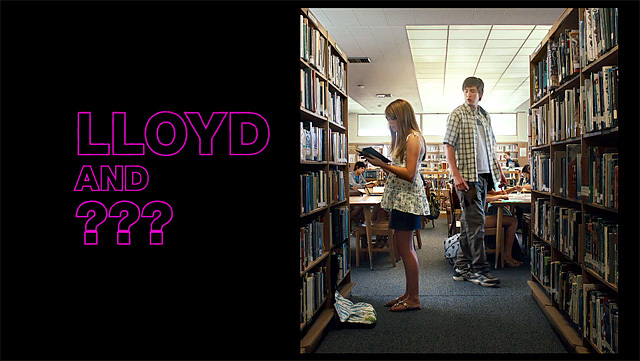 It's the scene where Lloyd meets Betsy (and gets shot down again). 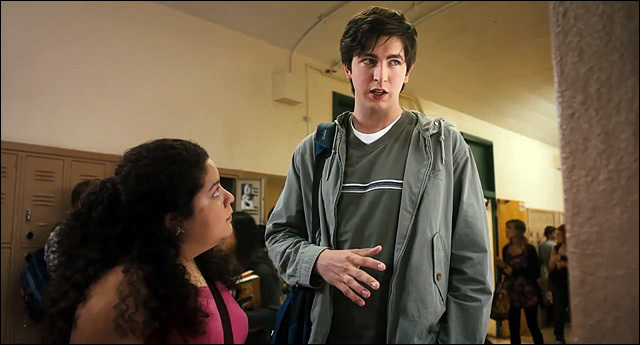 but this particular scene was filmed back in the art teacher's classroom at Lakewood High. It's an outdoor quad shot, but doesn't appear to be Burroughs. So what do you think? Lakewood High or Hughes Middle School? If you said Lakewood High, congratulations! 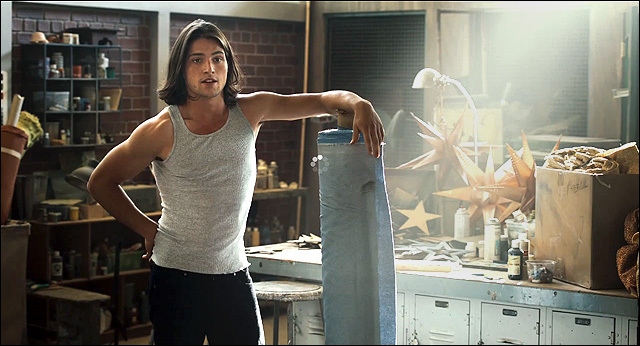 The photos on this page are stills from "PROM"
(which you can buy by clicking here) and are copyright Walt Disney Pictures.